The Coen Brothers (Joel and Ethan) are known to make the quirkiest movies known to mankind. The rules imposed upon directors by the studio system and cash registers do not apply to their movies. Their dare, brilliance and sardonic sense of humour (very black one at that) reached crescendo in Fargo, their most fascinating work to date. The tale of a mundane kidnap job gone horribly wrong is interesting; turn the very genre of crime drama upside down, and add to that a heavy dose of serio-comic elements, satire, wry and black humour, ironies, series of punches and counter punches, deadpan dialogues, graphic violence made to appear more comic than repelling by juxtaposing it with the strikingly beautiful and near-monochrome Minnesota landscape, a bunch of outlandishly idiosyncratic characters, and of course the indescribable yet instantly recognizable trademark touch of the Coens’ genius – and you have a masterpiece and an unforgettable cinematic experience at your disposal. As is usual in a Coens' movie, the casting for Fargo is fantastic. Frances McDormand as the motherly detective Marge with a razor sharp mind and an accent to remember, William H. Macy as the pathetically clumsy auto dealer and husband trying to strike big, the versatile Steve Buscemi as one of the kidnappers – weasly, nervous and twitchy, as compared to his cold, emotionless partner; every single player in the movie is terrific. 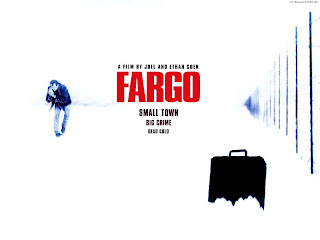 Fargo is an offbeat and a hugely entertaining masterpiece that mesmerizes the viewer every time it is watched.